The Las Vegas Area Travel Guide profiles several outdoor destinations that are close and convenient to the Las Vegas urban area. 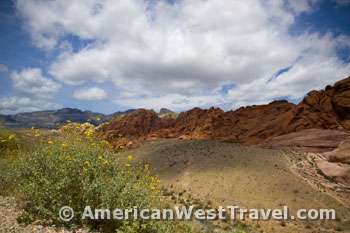 Red Rock Canyon Conservation Area is just west of the city and offers fine scenery and outdoor recreation. It is especially popular for bicycling. The slightly higher elevation makes it more comfortable than the city during the warm months. Mount Charleston and the Spring Mountains offer comfortable weather during the summer and year-round recreation with winter skiing. Floyd Lamb Park at Tule Springs is just ten miles north of the city. 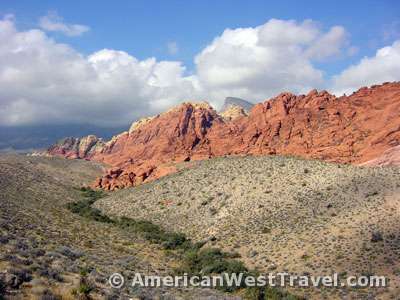 Red Rock Canyon offers a beautiful natural area just 17 miles outside of Las Vegas. It features panaromas of red rock hills and canyons with the Spring Mountains as a backdrop. There is a campground, 90 miles of trails, a 13 mile scenic drive, a visitor center, plentiful toilets, waterfalls, and petroglyphs. The area is popular with hikers, bicyclists, rock climbers, photographers, and runners. Facilities are wheelchair accessible. The park road reaches an elevation of 4,760 feet, so temperatures will be cooler than in the city. An easy and convenient place for Las Vegas visitors to get a taste of the outdoors. Follow Charleston Boulevard west – it becomes Nevada-159 – then follow the signs. Visit time: a few hours or more. Spring Mountain Ranch State Park is located within Red Rock Canyon Conservation Area at the base of colorful redrock cliffs. The 520 acre oasis was developed into a combination working ranch and luxurious retreat by a string of owners who have given the area a long and colorful history. The main ranch house is open daily for self-guided tours. Guided tours through the area are also offered. There is also a picnic area and many shade trees. The park is located off the Blue Diamond Road. Visit time: a couple hours. Many visitors will be surprised to know the mountains are only 35 miles from downtown Las Vegas. The Spring Mountains are west of the Las Vegas Valley and reach an elevation of 11,913 feet at Charleston Peak (aka Mount Charleston). Visitors to Las Vegas may conveniently enjoy complete relief from the desert heat during the warmer months and winter sports from late fall to early spring. Lodging, restaurants, campgrounds, ski lifts, and picnic areas are available at Mount Charleston. There are 53 miles of trails, and horseback rides are also available. Take US-95 north, then Nevada-157 west. Visit time: a full day trip or more. Only ten miles north of Las Vegas (US-95, then Tule Springs Road), Floyd Lamb is one of the easiest places for visitors to enjoy a taste of the outdoors. The park was once the site of a working ranch and later a guest ranch. The springs were thought to have been used by native people up to 10,000 years ago. Presently there are tree-shaded groves with picnic areas, adjacent to four small fishing lakes. There is also a walking and bicycle path as well as natural desert areas. Visit time: a good spot for lunch.